Another new angel in my 2012 Christmas angel series. 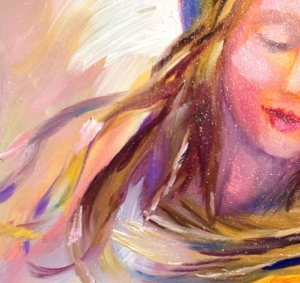 This angel painting and her sister angels will be featured at Smellie Bloomers’Christmas Open House on Sunday, November 11th. This loving angel includes painted text: “Love is how you earn your wings.” Thanks Joy for suggesting this quote, I think it fits this angel perfectly. What fun I’ve had painting angels this month, and I’m surely not finished. More angels coming soon, I promise. Thought I would mix it up a bit with something else that’s sweet (and no calories) , cupcakes! 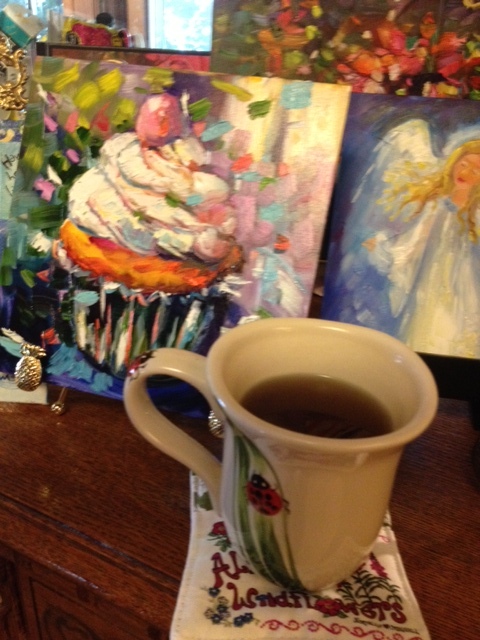 A dear friend of mine gave me this beautiful tea mat and yummy apple tea……….oh what a peaceful moment shared among my angel paintings, you can get a peek in the background of this picture. and another angel print winner………. 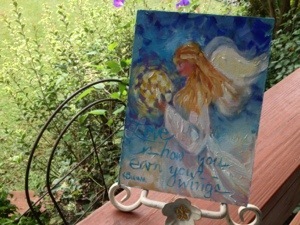 Congratulations to Joy Warren who submitted this angel quote, “Love is how you earn your wings”. 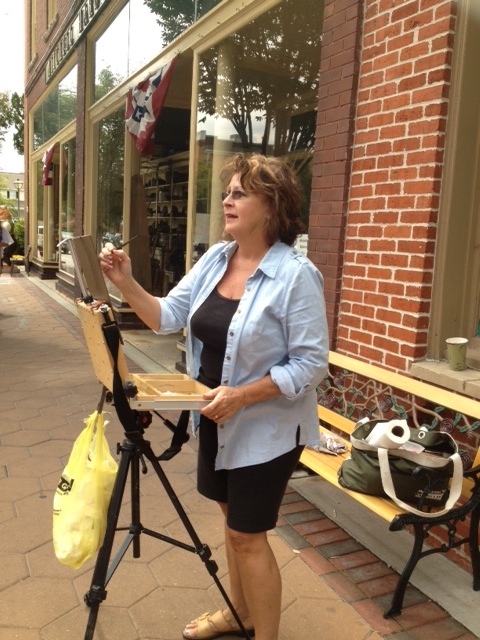 Thanks Joy for sharing this with me, you win an angel print from one of my angel oil paintings. 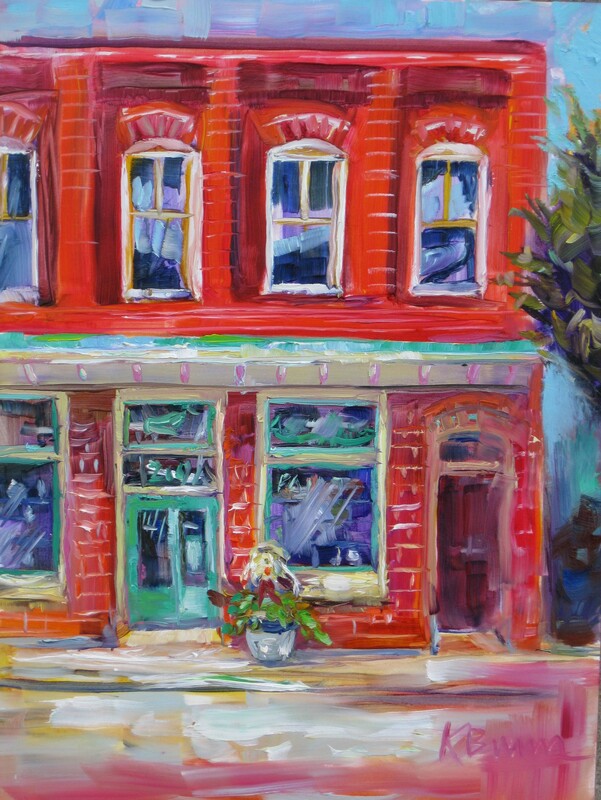 My angel paintings will go on sale at Smellie Bloomers in Elizabethtown during their Christmas Open House in November! Thanks so much to all of you angels out there who shared your favorite quotes. announcing an angel print winner………..
Congratulations to Karen Pope for sharing a sweet angel quote that I used in my new Christmas angel series, oh, and there will be more winners–yippee! 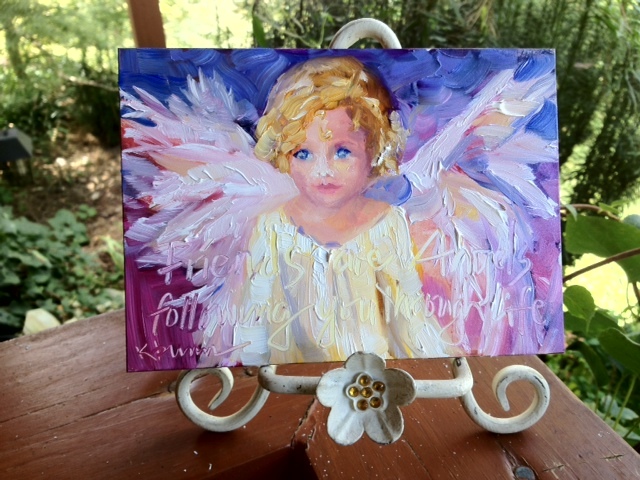 There are still a few more days (deadline is September 18th) to enter your best angel quote………just keep it short and sweet please, like Karen’s…”Friends are angels following you through life.” Karen and the rest of the winners will be receiving free angel prints! All you have to do to have a chance at a free angel print is to leave me a comment with your favorite angel quote. 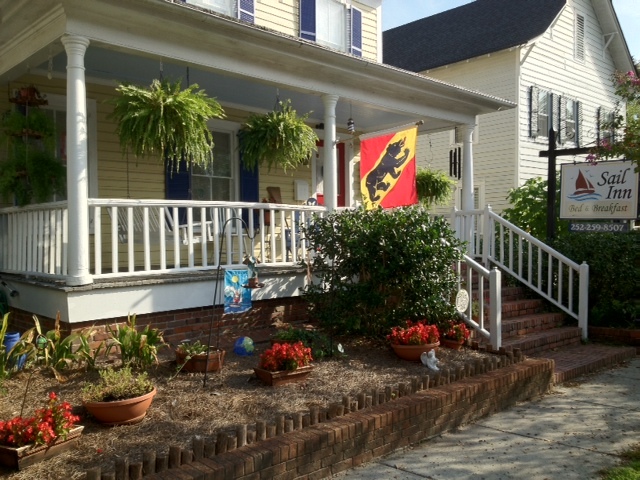 Thanks and keep em coming friends! I sure could use your help! Asking for SHORT quotes, sayings, verses,etc. that are angel related. Here’s an example…”I believe there are angels among us.” please post YOUR suggestion and you will be automatically entered in an angel print drawing. Please do not use the angel quote above, I am looking for very short words/text/ verses or quotes to incorporate in my paintings If I do use your suggestion, you will receive a free angel print! 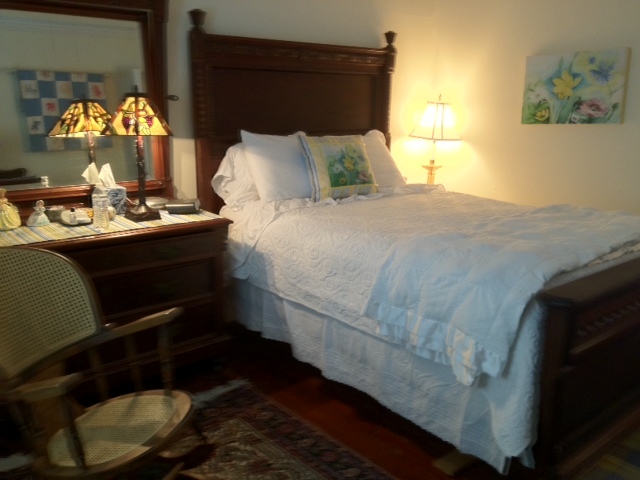 Please post by September 18th…..post away angels…..